This has been such a great year for us. Between me graduating from college, both of us getting fantastic jobs (me as a teacher, Noah as an insurance agent), and both of us (not to mention our families) having our health, we are so completely blessed. I was also able to build a fun little side job this year! It’s been a good one! And, might I add, I am SO looking forward to next year. Alabama’s winning their THIRTEENTH national championship, and there might be a few exciting things up our sleeves…stay tuned! Love the card, so cute!! What an adorable card! It's so fun =)Thanks so much for joining in the fun! Merry CHRISTmas!! Very cute card…I *heart *polka dots*! :)Merry Christmas!! Very cute! 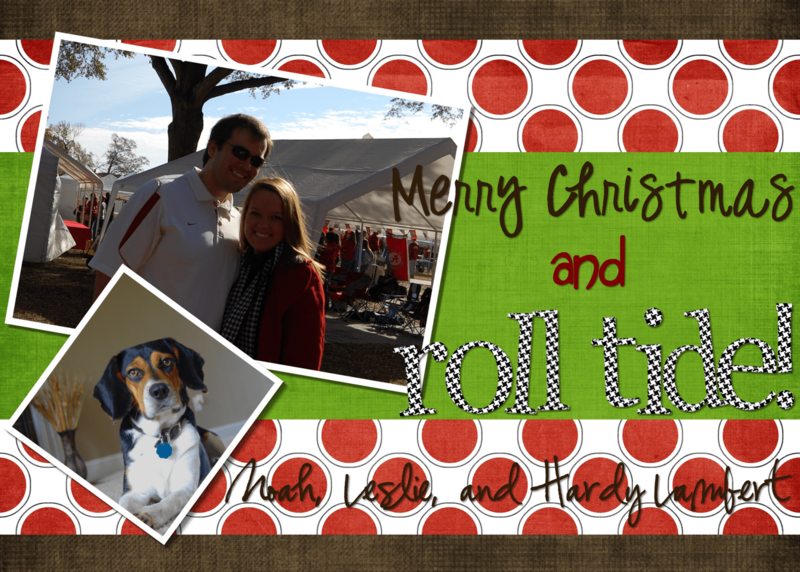 I'm a Roll Tide girl myself!Merry Christmas! Love it….I am such a sucker for polka dots! And I love that you incorporated football into it as well. Us SEC girls love our football, don't we?Merry Christmas! Super cute card! We put a game day picture on our card too. 🙂 I also wanted to put a picture of our kitten on it, but the hubby vetoed. Merry Christmas! Oh I LOVE the polka dots – they are my new obsession! 😉 Thanks for sharing! That card is super cute! Happy Holidays! I love the card!! !